Devil’s Creek depicts a typical small town in the western State of Nevada, USA in the late 1800’s or early 1900’s. Several different Railroad Company’s run trains on the single track that passes through the town, bringing freight in and shipping goods out. There is also a regular passanger service linking Devil’s Creek with other towns and cities throughout western and eastern States. Devil’s Creek has prospered as a result of the railroad, and this is most evident from the businesses that have developed around the station yard. These include a brewery, a fruit packing company and a thriving produce house, Refrigerated boxcars (reefers) are cleaned and recharged at the ice house and platform, and there is also a precious metal mine on the outskirts of the town. Most of the structures on the layout are either built from lasercut wood craftsman kits obtained from the USA, or scratch built from wood and based on prototype photographs. The track arrangement in the yard allows full and empty cars to be switched without interrupting the passage of trains on the through track. 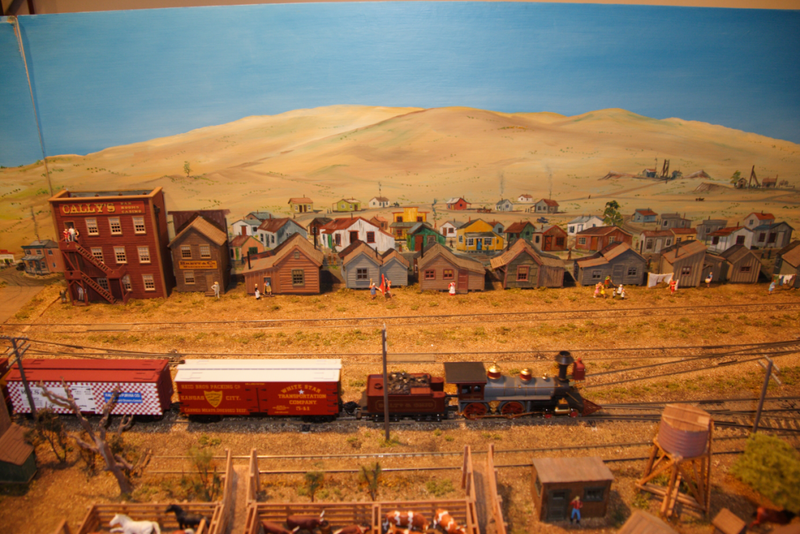 Scenic work and backscenes are based on photographs of locations along the Virginia & Truckee RR, and the trees and vegetation near the creek provide some visual relief from the otherwise arid desert landscape, Several detailed mini-scenes have been included to create the impression of a busy town.